Turmeric is a spice widely used in Indian, Asian and African cuisines. The dried roots have also been used in traditional Ayurvedic and Chinese medicine systems for more than 4,000 years to treat inflammation, liver disease, gallstones and arthritis. There is evidence that the herb’s active ingredient, curcumin, may have antioxidant properties, although few studies have been done in humans. Because this compound may cause blood sugar to drop, consult your physician before using turmeric therapeutically if you have diabetes. The botanical name for turmeric is Curcuma longa, also known by the common name Indian saffron. This shrub-like plant is a member of the Zingiberaceae family of plants, which also includes cardamom and ginger. Native to India, and widely cultivated throughout South Asia and Africa, turmeric is the seasoning that provides the characteristic warm flavor to Indian curry. The rootstock of this herb also lends golden color to mustard, butter and certain cheeses and flavors soups, baked goods and sweet foods in Middle Eastern cooking. Turmeric is also a food additive used as a preservative and coloring agent, often in combination with annatto. The medicinal part of the plant is the stewed and dried rhizome, which, according to the “Physicians’ Desk Reference for Herbal Medicines,” contains up to 5 percent volatile oils, including highly aromatic alpha- and beta-tumerone and zingiberene. The root also contains up to 5 percent curcuminoids, most notably curcumin. According to the National Center for Complementary and Alternative Medicine, this plant phenol demonstrates antioxidant, anti-inflammatory and anti-cancer activity in some animal and in vitro studies. 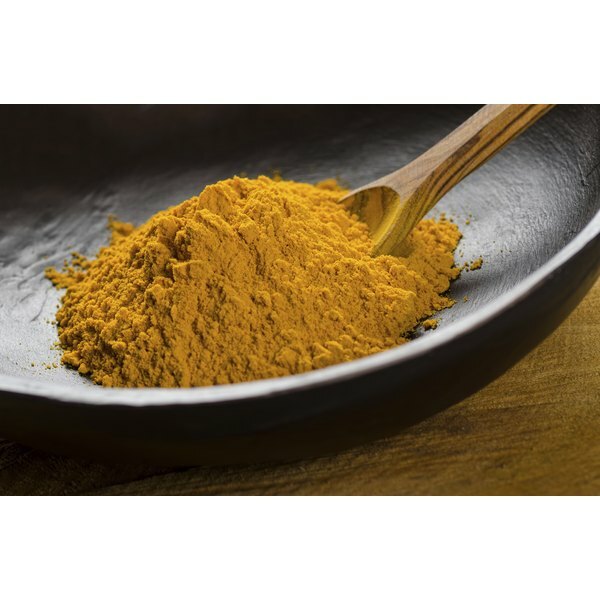 The University of Maryland Medical Center says that studies with diabetic animals have also shown that turmeric lowers serum cholesterol and blood sugar levels. A study published in the September 1, 2011, issue of “Diabetes” shows that curcumin blocks the activity of a protein transcription factor called nuclear factor-κB, which is involved in inflammatory responses and becomes activated when blood sugar levels are high. By injecting specific immune cells of insulin-resistant mice with curcumin compounds, the scientists were able to inhibit nuclear factor-κB and improve insulin utilization. Similar findings were reported in a study published in "Food and Chemical Toxicology" in May 2011, which also compares the efficacy of curcumin to rosiglitazone, a pharmaceutical drug used to lower blood sugar and decrease insulin sensitivity. Although turmeric may show promise as a potential therapy for type 2 diabetes, this herb may increase the effects of diabetes drugs and the risk of hypoglycemia, or low blood sugar. Turmeric also interacts with other medications, including stomach acid reducers and blood-thinning agents. Do not use this herb if you are pregnant or nursing, or if you have a history of liver or gallbladder disease. Physicians’ Desk Reference for Herbal Medicines; Thomas Brendler, et al. Diabetes; Targeting Curcusomes to Inflammatory Dendritic Cells Inhibits NF-B and Improves Insulin Resistance in Obese Mice; S.K. Yekollu, et al. Diabetes; Activation of Nuclear Factor-κB Induced by Diabetes and High Glucose Regulates a Proapoptotic Program in Retinal Pericytes; G. Romeo, et al. Food and Chemical Toxicology; The Antihyperglycemic Effect of Curcumin in High Fat Diet Fed Rats. Role of TNF-α and Free Fatty Acids; M.A. El-Moselhy, et al. Are There Natural Alternatives to Antiplatelet Medication?